This piece was originally written by Steven Gonder (@sdgblu4ever on Twitter) . His blog is here. In addition, please forgive the weird black highlight blocks in the text, it must've been some glitch and I could not get rid of it so I tried to make it so that you could at least see the text, which hopefully you can. Apologies. Before reading this analysis, I recommend forwarding the video to 5:00 and leaving it for about 10 seconds (thanks to Rapheal Leonardo for finding this). This tweet is clearly visible on the Twitter feed of Murtaza Hussain. For reference, this is the same Murtaza Hussain who previously had referred to Maajid Nawaz as both a "talking monkey" and a "porch monkey" in separate but related tweets, and also doxed The Nation writer Aki Muthali. As a writer for The Intercept, headed by the notoriously anti-"New Atheist" Glenn Greenwald, Murtaza Hussain is very much familiar with prominent secular-endorsing writers, and Hitchens is no exception. 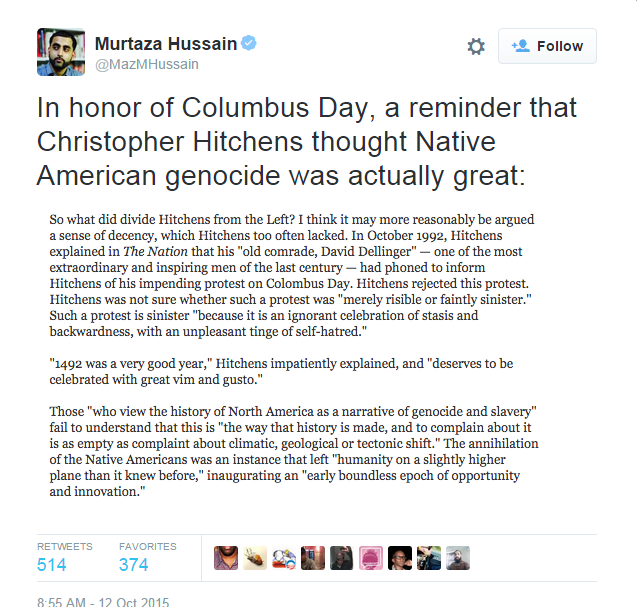 In predictable form, he seemed to interweave the public disdain towards Columbus Day with building animosity towards and taking cheap shots at Hitchens. I admit that when I read this tweet, the passage seemed convincing, that perhaps Hussain may have been on to something. Unfortunately for Hussain, this was not the case; the passage is severely out-of-context and integrated with strawmen. An accurate representation of the original context can be seen here. It's almost immediately apparent the passage excludes that Hitchens took issue with the revisionist nature of the anti-Columbus movement: "It is risible in the same way that all movements of conservative anachronism are risible, and reminds me of Evelyn Waugh's complaint that he could never find a politician who would promise to put the clock back." The passage, of course, neglects to mentions that, with the writer instead resting on the laurels of providing a narrative degrading Hitchens. Hitchens further substantiates his dislike for anachronistic narratives, referencing that territorial conquering was by no means exclusive to European settlers: "This details the long courtroom battle fought by various factions of the Sioux to reclaim their rights in the mountains of South Dakota. You can guess the story: treaties broken, lands filched, settlements put to the torch, women and children vilely abused. And all of it done by the Sioux to the Kiowa Indians, who had controlled the Black Hills before the Sioux got there in 1814. Actually, the book deals mainly with the greed and depredation of the palefaces, which is no doubt as it should be. But it is honest enough to say that the Sioux did drive off the Kiowa, and it quotes Chief Black Hawk saying candidly, 'These lands once belonged to the Kiowas and the Crows, but we whipped these nations out of them, and in this we did what the white men do when they want the lands of the Indians.'" It's also worth noting here that Hitchens considered addressing the abuses of the "palefaces" as being the correct course of action. Hitchens continued: "This is only a micro-illustration of the absurdity of founding a claim of right or justice on the idea of the indigenous. The Arawaks who were done in by Columbus's sailors, the Inca, the Comanche and the rest were not the original but only the most recent inhabitants." The second major contention he had with the anti-Columbus movement was the element of pessimism: "They can think of the Western expansion of the United States only in terms of plague blankets, bootleg booze and dead buffalo, never in terms of the medicine chest, the wheel and the railway." 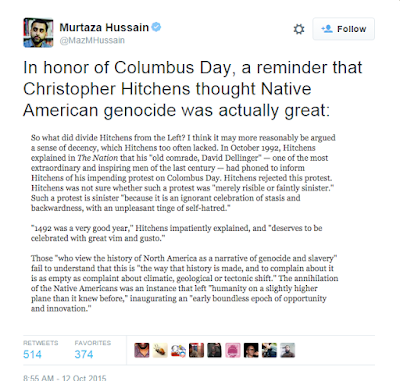 This is by no means a settled moral fact, but it's a far cry from the ludicrous statement that Murtaza Hussain provides that claims Hitchens thought genocide was great. The passage writer rearranges and strawmans Hitchens quotes "Those 'who view the history of North America as a narrative of genocide and slavery' fail to understand that this is 'the way that history is made, and to complain about it is as empty as complaint about climatic, geological or tectonic shift.'" by neglecting to note that genocide and slavery is not the antecedent, but rather the actual antecedent is taking the good with the bad of progressive civilization: "They can think of the Western expansion of the United States only in terms of plague blankets, bootleg booze and dead buffalo, never in terms of the medicine chest, the wheel and the railway." Hitchens also supported Sioux getting what was their due, but again felt they had disputable rights to the land they inhabited: "Reapportioning Andalusia according to "precedent" would be as futile an idea as restoring Sioux rights that are only "ancestral" as far back as 1814. The Sioux should be able to claim the same rights and titles as any other citizen, and should be compensated for past injury. That goes without saying. But the anti-Columbus movement is bored by concepts of this kind..."
The passage writer so ignorantly or disingenuously suggests that "The annihilation of the Native Americans was an instance that left humanity 'humanity on a slightly higher plane than it knew before,'" but again shoehorned the statement out of context. The original context wasn't referring to Native American genocide but advancement of civilization by various means (which don't by default mandate the extermination of native settlers): "But it is sometimes unambiguously the case that a certain coincidence of ideas, technologies, population movements and politico-military victories leaves humanity on a slightly higher plane than it knew before. The transformation of part of the northern part of this continent into "America" inaugurated a nearly boundless epoch of opportunity and innovation, and thus deserves to be celebrated with great vim and gusto..."
Whether you agree with what Hitchens actually said or not, Hussain and this mysterious passage writer (Hussain didn't link the article he got it from) both severely distorted what Hitchens actually wrote. The passage writer is more to blame here, but Hussain is not a Good Samaritan when it comes to ethics of discourse. It would be a relief if this were the last time we'd see vile misinformation created by, endorsed by, or propagated by The Intercept, but it's most likely not the last time, given the precedents and morals of the associated individuals.